A #BlackMenStandUp even in Lima brought out few black men, but opened a dialogue that raised questions about the role black men play in the community. LIMA—- An event called #BlackMenStandUp was designed to encourage black men to be the best version of themselves they can be. The event, held Saturday at Lima’s Holiday Inn, was organized by Amber Basares. “It’s a challenge to the black men of the Lima community to do what they are asking others to do, to stand up. Basically, [the challenge is] to be mentors, entrepreneurs, to join the military, to join the police force, to educate themselves, become politicians, to go out there and get better jobs to stop complaining,” Basares said. But the event fell short of hitting the target with black men. “Here it is. It’s a Black Men Stand Up event, and there are not a lot of black men participating. But if you go and ask a black man what is the problem or what is wrong in society or in Lima, they are complaining the most. But you put them in a room and you say, ‘What can we do to help?’ and they are uproaring the most,” she said. The answer to getting black men to stand up to be better role models is elusive to Basares. “I don’t have the answer. That’s why I wanted to bring them together today. We’re offering opportunities from prominent members of not only Lima, but of Ohio to be here to offer solutions and the black males are not here to sit at the table with these black men. I guess we’ll just try again. It will be a challenge,” she said. Bishop Darnell Williams of New Life Church International was there to give support to Basares and her cause. “My message is to support and lend a hand to uplift and encourage minority men to become all that they need to be,” he said. The problem of black men attaining their potential is something Williams says is multifaceted. “I think there’s just a plague and scourge of fatherlessness. [It] has an impact on our nation that I just don’t think we know how to really understand how big an issue it is. Growing up in a single-parent home myself, I’ve had to deal with and face those issues, and they’re real issues — they’re hard issues. I think just educationally, the structure of the family, systemic poverty, incarceration issues, engagement involved in the justice system, it’s a multifaceted set of issues, but at the end of the day, if we can just speak a word of hope and encouragement into the life of a young man, it will make all of the difference in the world,” he added. 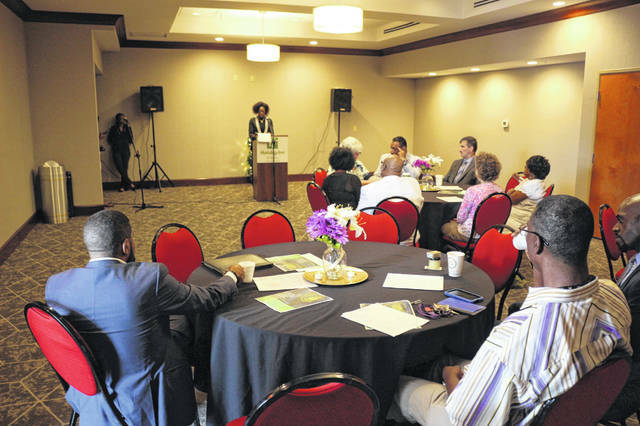 https://www.limaohio.com/wp-content/uploads/sites/54/2018/07/web1_BlackMenStandUp-toned.jpgA #BlackMenStandUp even in Lima brought out few black men, but opened a dialogue that raised questions about the role black men play in the community.